Buttington (Welsh: Tal-y-bont) is a village in Powys, Wales, less than 3 km from Welshpool and about 300 m from the River Severn. The Montgomery Canal passes through the village. The village stands on a slight rise above the river's floodplain, by the ancient ford called Rhyd-y-groes, where Offa's Dyke meets the Severn. The ford retained strategic value: reportedly in 1039 a battle took place here between Welsh and English forces. At Buttington in 893 a combined Welsh and Mercian army under Æthelred, Lord of the Mercians, defeated a Danish army which had marched from Essex. This was the decisive battle in the war against the Viking invasion of the 890s. The Buttington Oak stood near the village until February 2018 and was said to have been planted by local people to commemorate the battle. ^ Buttington, Clwyd-Powys Archaeological Trust. ^ * Charles-Edwards, T. M. (2013). Wales and the Britons 350-1064. Oxford University Press. pp. 507–508. ISBN 978-0-19-821731-2. ^ Smyth, Alfred P. (1987). Scandinavian York and Dublin. Irish Academic Press. pp. 33–35. ISBN 0-7165-2365-5. ^ "1,000-year-old oak on Offa's Dyke falls". BBC News. 16 February 2018. Retrieved 19 February 2018. 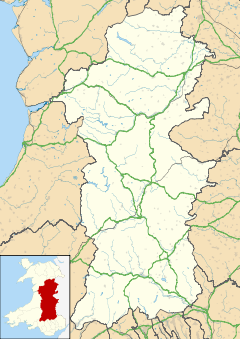 This Powys location article is a stub. You can help Wikipedia by expanding it.